As summer sets in, city staff are already making preparations for the coming fall. For the Downtown Eastside this means that while their Local Area Plan will not be formally approved until November, the foundation of the plan is already being put into place. Once implemented, the plan will have wide-ranging effects on the DTES and will determine the future of the neighborhood. For the past two weeks, activists and community members in the neighbourhood have been building support around a list of demands they would like to see prioritized in the looming Plan. 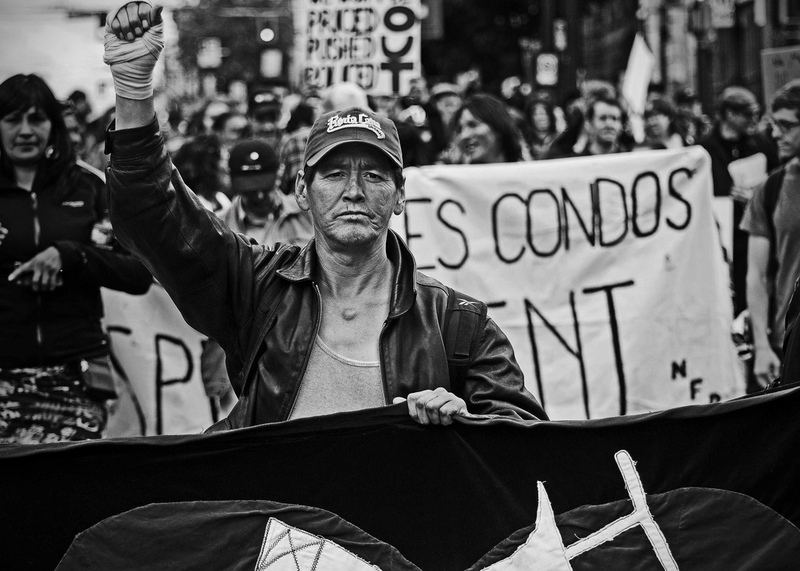 Their organizing efforts culminated on June 11th, when the DTES community delivered an alternative Local Area Plan, signed and supported by 3,000 DTES residents. The Local Area Planning Process (LAPP) committee is composed of both organizations and residents who have a stake in the DTES. The majority of the committee is made up of low-income residents, reflecting the fact that the majority of neighborhood residents (70%) are low-income. For the past two years, the LAPP committee has been advising the city on its area planning for the DTES. In addition to the formal LAPP sessions, low-income members of the committee have formed the Anti-Gentrification Caucus, a sub-committee of the LAPP. The caucus has been meeting weekly since September to bring accountability to the back-and-forth with the city and ensure that the voices of low-income people are well-represented in the planning process. On May 3rd the City hosted an open house at Pigeon Park Savings, with a summary of the planning process to date. In a sign of things to come, the presentation reduced the importance of gentrification, which low-income members of the LAPP advisory have persistently raised as a priority issue in the consultations. In the city’s summary report, the social and economic impacts of gentrification are minimized. 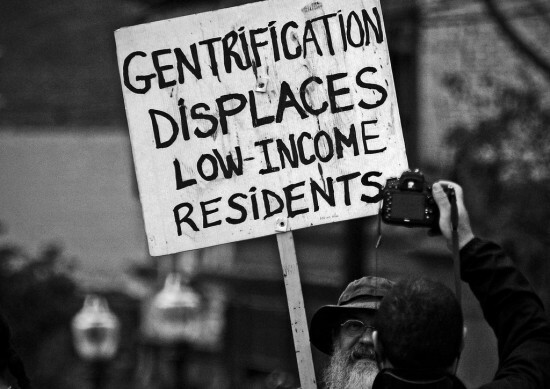 Gentrification is instead described in abstract terms, as something which is “compromising the feeling of inclusion, belonging, safety and connectedness of residents.” In response to this selective summary, the Anti-Gentrification Caucus created a parallel plan: the Social Justice Zone plan. 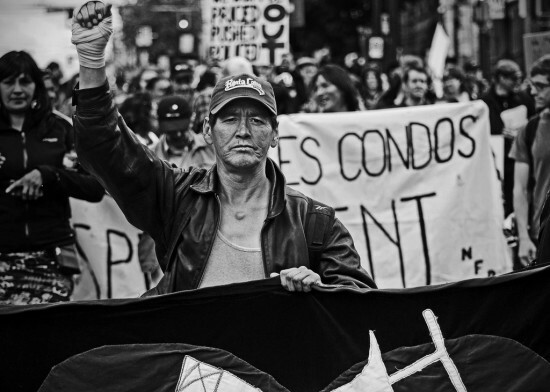 The Social Justice plan was produced at a Town Hall meeting with the DTES community. The final plan includes five demands: No condos before low-income people’s homes are secured and protected; ensure jobs for low-income residents; reverse the loss of homes and shops for low-income residents; protect residents’ safety; and end discrimination so everyone can access the services they need. The full explanation of how these demands would be achieved is laid out in the official statement on the website of the Carnegie Community Action Project (CCAP), one of the organizations involved in the LAPP. Two weeks ago, the Anti-Gentrification Caucus undertook an extensive petition drive to gain support for the demands. Volunteers collected signatures for ten consecutive days, in SRO hotels, on the street, in the Union Gospel Mission line up and at the street market. The petition drive was finalized with a Rally against Gentrification and Displacement on June 11th, with over 300 DTES residents present. The primary focus of the Social Justice plan is to halt the most immediate threat to the neighborhood: the gentrification that continues to push out low-income residents. Already there has been a substantial loss of private units of affordable housing, according CCAP’s 2012 hotel survey and Action Report. From 2011 to 2012, at least 426 units — all of which had previously rented below $425 — passed the low-rate threshold and became unaffordable, particularly for people on income assistance or disability. Throughout the LAPP process, the main role of the Anti-Gentrification Caucus has been to analyze and respond to city documents, and to share those documents with the people directly affected by planning decisions. Along the way, many of those involved have begun to question to benefits of working within the LAPP framework. “Through the process we’ve noticed the steady evaporation of low-income people’s priorities from [city documents],” Ivan Drury tells The Mainlander. According to Drury, who is no longer an official member of the LAPP committee since being removed by city manager Penny Ballem, the evaporation of low-income priorities is what prompted the Caucus to begin work on forming a parallel Social Justice zone plan. The vision of a ‘Social Justice Zone’ is primarily that of a neighbourhood “where low income and vulnerable people have a right to be and won’t be pushed out,” according to a statement released by the Anti-Gentrification Caucus. Currently the Oppenheimer district of the DTES is the only part of the city that has inclusionary zoning by-laws in place. This means that any new development in the area must contain at least 20 per cent social housing. The inclusionary zoning policy was passed in 1982 and is one of the main reasons property values have stayed lower in this affordable area. “That 20 per cent inclusionary zoning has held off real estate speculation and development in the oppenheimer district for thirty years,” according to Drury. “But now the real estate market is too bullish, too powerful, and can easily meet that twenty per cent social housing requirement and still make profits.” The Social Justice Zone plan seeks to raise the proportion of social housing in new developments to 100 per cent, while also designating Hastings Corridor and Thornton Park 70 per cent where previously there was no inclusionary zoning. A handful of social housing units in a new condo development does little to counteract the economic ripple effects generated by market development, according to the diverse Caucus. If hundreds of affordable units are being lost in the DTES every year due to gentrification, this 20 per cent rate does not compare favorably on the balance sheet of losses and gains. To make matters worse, social housing is increasingly defined by the city in a flexible manner. So-called ‘social housing’ units in the proposals of recently approved condo developments have included units upwards of $900 for a one bedroom, wildly out of reach for welfare recipients and for most of the DTES, where the median annual income is $13,000. After organizing the June 11th rally, the burgeoning Anti-Gentrification Caucus plans to take a next step by reaching out to other organizations throughout the city. They believe that Vancouver residents living beyond the DTES can get behind the the five-point plan. The ability for the Caucus to work both from the inside and outside of the planning process has many advantages. At the drawing table lies a world of urban planning and policy speak. In the streets, a language of justice and urgency. When these two worlds are brought together it can make for a powerful combination. But the Caucus is working amidst moving targets, and the effects of gentrification have already taken their toll on the neighbourhood.